Gables with decorative wood brackets add interest to this modest, three bedroom home with cozy front and back porches. Expanded by a space enhancing cathedral ceiling, the great room features a central fireplace with flanking built-ins and is open to an efficient kitchen. The dining room receives refinement from an elegant tray ceiling and, along with the bedroom/study and master suite, accesses the back porch. The master suite maintains a private bath and walk-in closet, while a hall bath with linen cabinet services the two secondary bedrooms. 1st Floor: 1307 Sq. 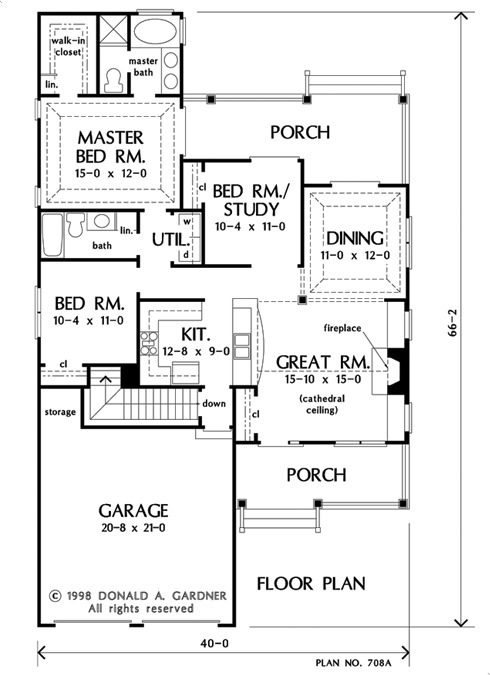 Ft.
House Dimensions: 40' 0" x 61' 10"
Great Room: 15' 10" x 15' 0"
Master Bedroom: 15' 0" x 12' 0"
Bedroom #3 : 10' 4" x 11' 0" x 9' 0"
Porch - Front : 18' 8" x 7' 0" x 0' 0"
Porch - Rear : 24' 4" x 9' 8" x 0' 0"
Great Room (Cathedral): 15' 10" x 15' 0" x 15' 0"
Kitchen : 12' 8" x 9' 0" x 9' 0"
Utility Room : 3' 0" x 5' 8" x 9' 0"
Garage : 20' 8" x 21' 0" x 0' 0"
Garage Storage : 4' 4" x 4' 4" x 0' 0"
Master Bedroom (Tray): 15' 0" x 12' 0" x 10' 6"
Bedroom / Study : 10' 4" x 11' 0" x 9' 0"